We fell asleep listening to the rain, so it was a lovely surprise to wake up to blue skies and sunshine. Things were looking up for our last day, until I looked closely at the time on my ipad while lounging in bed with a cup of tea. We had set our alarm for 7.30, planned to meet the others for breakfast at 8.00 but my ipad seemed to be telling me it was 8.40. I was confused, until I realised we had used Adrian’s UK phone for the alarm, which was still set on UK time and we were suddenly in a flap and officially late for breakfast. It wasn’t a good start for me. I ended up finishing my lemon and ginger tea with breakfast and stupidly declining a coffee. 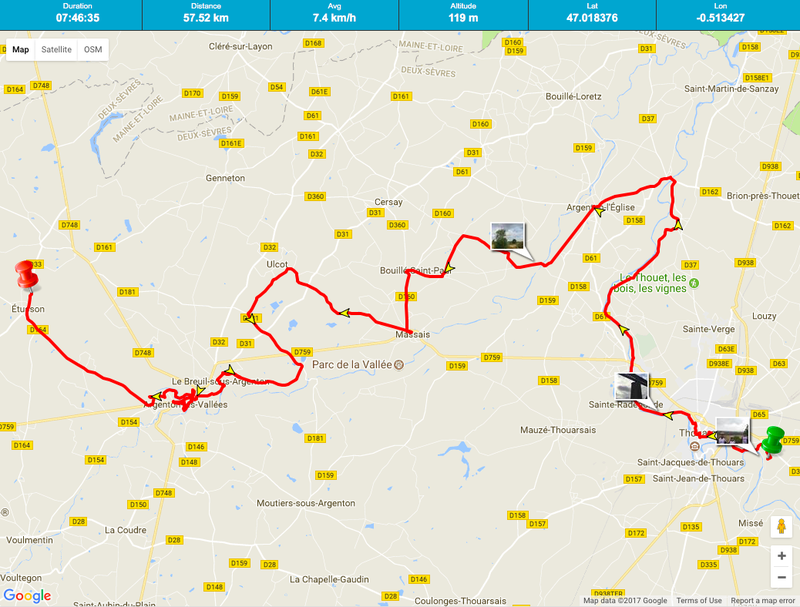 I had often been slower than the others during the week, but that was nothing compared to my snail-like progress this morning for the 22kms into Bressuire without caffeine. It is a mistake I will not be repeating. They all did a lot of stopping and waiting for me to catch up and I could tell Adrian was getting quite worried. Happily, with caffeine in my system once more and pepped up by a surprise visit from a local journalist who was waiting in Bressuire to interview us (we were beginning to feel like celebrities), the rest of the day was much easier for me. 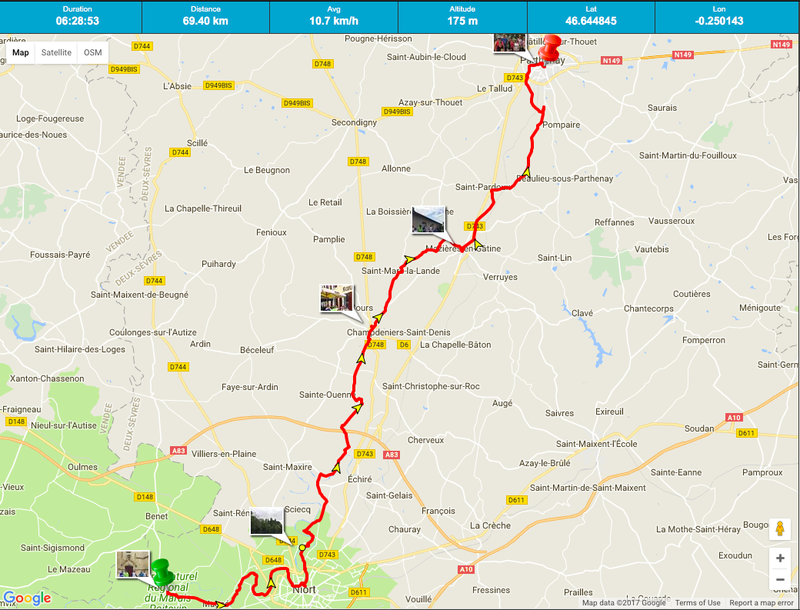 It was an easy, flat run to Moncoutant along the old railway line and thanks to the family who were waiting for us (to make a donation), we were pointed in the direction of a restaurant for our final meal together. 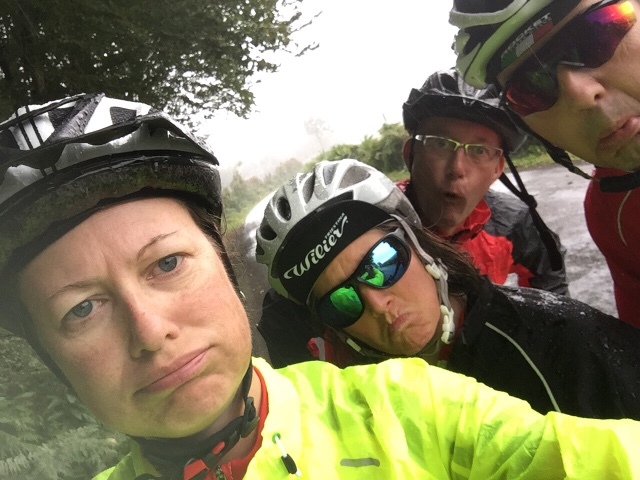 There was certainly a lot to talk about over lunch and we all agreed that despite the physical effort involved and uncomfortable weather, we’d all had fun and having spent so much time in each others company it would seem rather strange saying goodbye later in the day. Things could have been so much different. We were not close friends when we dreamt up this challenge; in fact we had never actually met face to face until our first planning meeting. 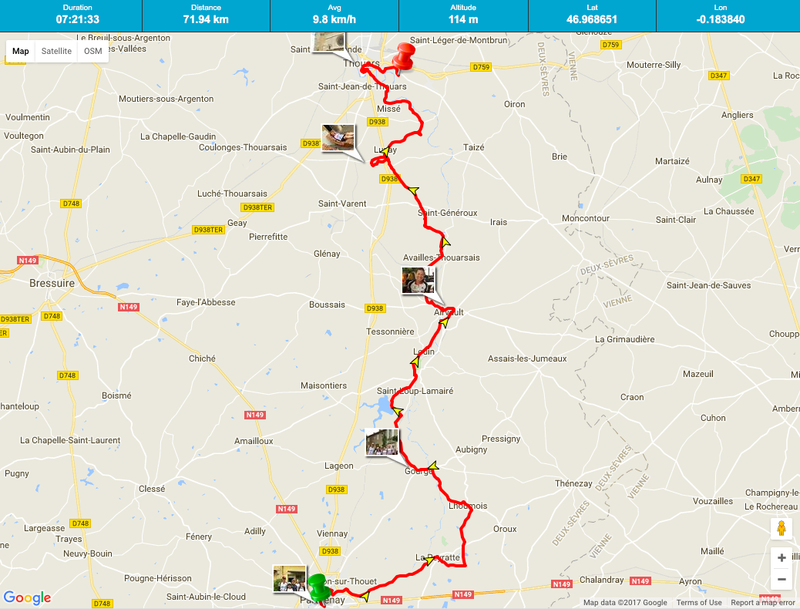 Over the course of a year we managed about three or four bike rides together, but none of those rides were over 40km, although we had got to know each other quite well via the countless emails back and forth attempting to organise the event. 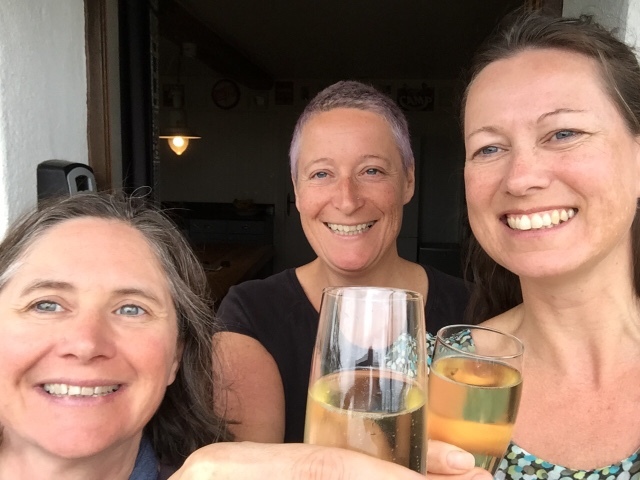 It had been hard work, but we unanimously agreed it had been worth it and that we’d do it again. The weather might have been against us, but the support we received during the week had certainly made up for it. Just to ensure we knew who was boss, the rain reappeared shortly after lunch and was so heavy we had to take shelter under the trees, but we all decided that whatever the weather we would arrive in Secondigny with smiles on our faces and wearing our team jerseys (without rain jackets) with pride. 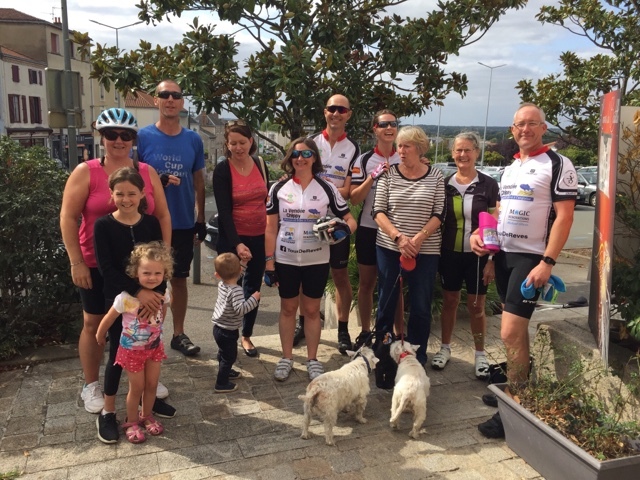 It was a great feeling to cycle back into Secondigny and rather emotional to be greeted by so many relieved family members and friendly faces; many of them our cycling friends who had completed various stages with us during the week. Sarah and I were presented with flowers by the mairie of Secondigny and there were hugs and smiles all around. Despite being soggy from top to toe, it was a fantastic finale to an amazing adventure. 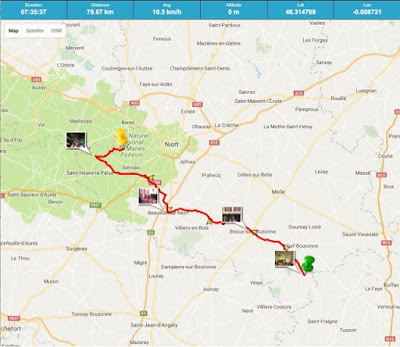 In six days we had completed a 437km figure of eight circuit around the Deux-Sèvres, exploring our department following cycle routes and quiet back roads, meeting some amazing people and having great fun along the way. We really can’t thank everyone who helped and supported us in so many ways enough. THANK YOU. 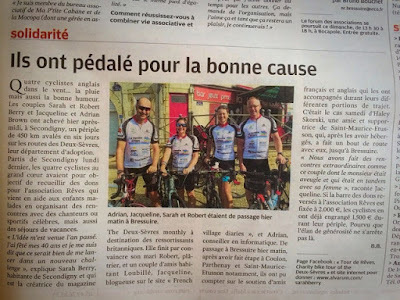 The Tour de Rêves - a charity bike ride around the Deux-Sèvres department in France, undertaken by four mad friends, supported by many others, all with the aim of raising money for Rêves a charity making dreams come true for seriously ill children. 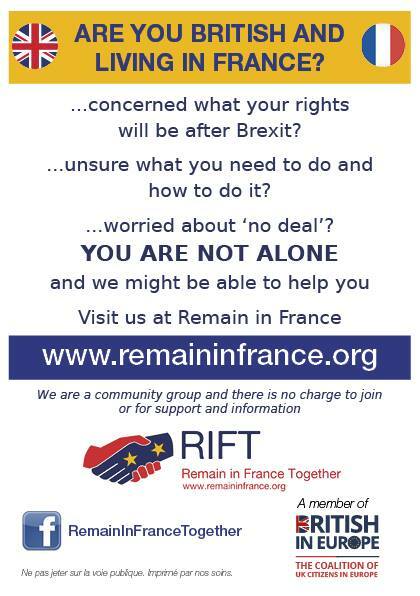 To make a donation to Rêves in our name, please clickhere. 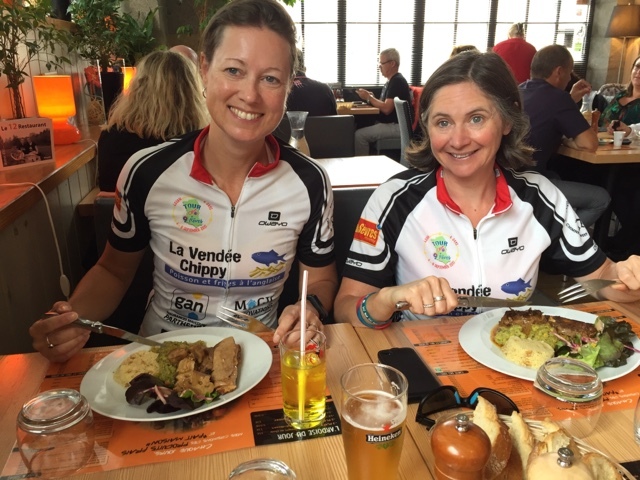 To read the other posts about our six day adventure click the links below. 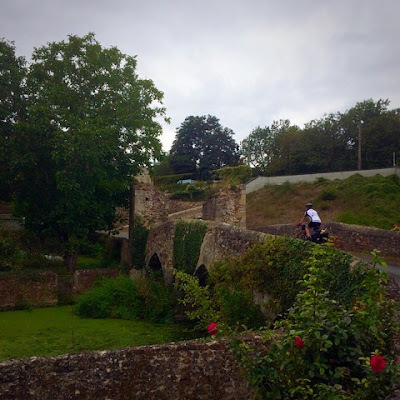 We left the Mortons under grey, heavy skies with more than a hint of rain in the air and made our way carefully (and painfully slowly in my case) down, up and down again the steep streets of Thouars, heading for the river. We cycled under a railway viaduct designed by Gustave Eiffel and then stopped to put our rain jackets on. It was so unfair we getting so much rain when September days are usually dry, warm and sunny. Thankfully having drip-dried over a morning coffee in a village bar, the skies cleared and the day began to look brighter. 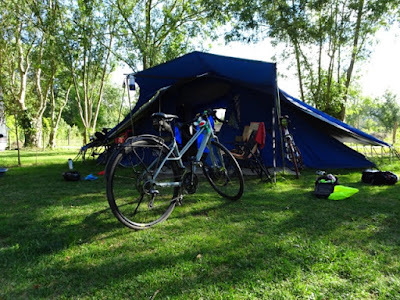 Once we left the Vélo Francette (whose company we had had for over 150kms) to continue it’s route north through the Loire and on towards the coast in Normandy, we picked up the Vélo-route La Vallée de l’Argenton. 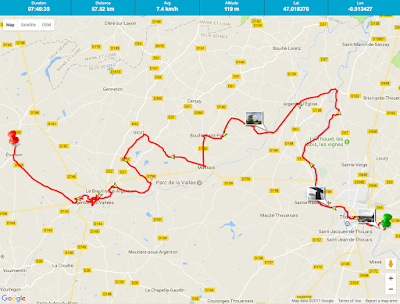 This took us through vineyards, pretty villages and up and down more killer hills and I seemed to get slower and slower and further behind the others. 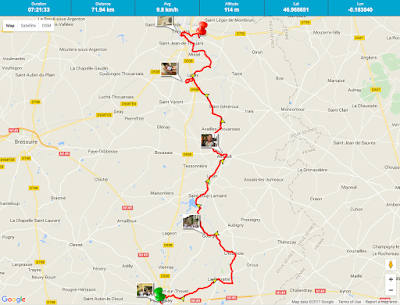 I was certainly glad today was only going to be about 55km as I seemed to be walking a good number of them. 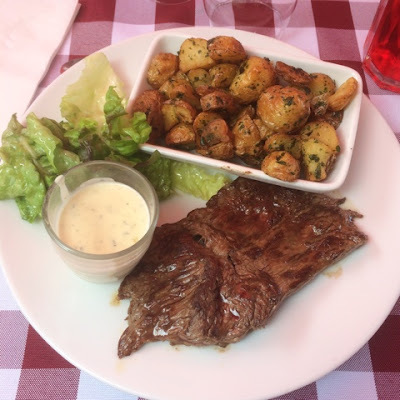 We lunched at Chez Fanny in Massais, by the skin of our teeth. Sadly, for the second day running we had arrived in a village with a bar, only to find a funeral taking place. Yes, really, we couldn't believe it either. Our morning coffee yesterday had to be abandoned, but we had a bit more luck today and although there was no choice available, a starter of charcuterie and a plat of steak with beans were served to four tired, hungry and very grateful cyclists. The afternoon was more hills, villages with narrow streets and pretty bridges plus our first puncture of the week, but at least we reached Etusson and our last beds of the trip before the rain began again. Haley and dog George certainly looked after us well, with Champagne, roast chicken and lots of laughs, as the rain poured down outside. It was looking more likely that our final day on the bikes was going to be a wet one, again. 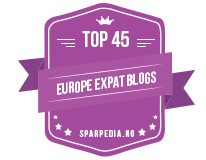 Toasting our success so far. 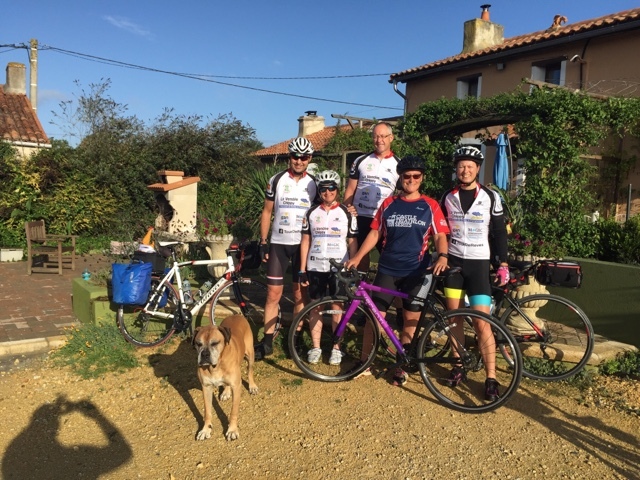 We slept well, woke up to sunshine and even had other cyclists to chat to over breakfast at the chamber d’hôtes. Unfortunately they had arrived in Parthenay from the north, via the Vélo Francette (the direction we were headed in) and all they could talk about were the relentless hills. I didn’t need to hear that. 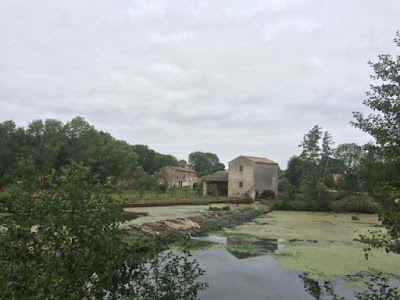 I had woken elated that I’d slept well and as my legs had already carried me half way around the Deux-Sèvres I thought I was ready for anything. It soon became apparent I wasn’t. 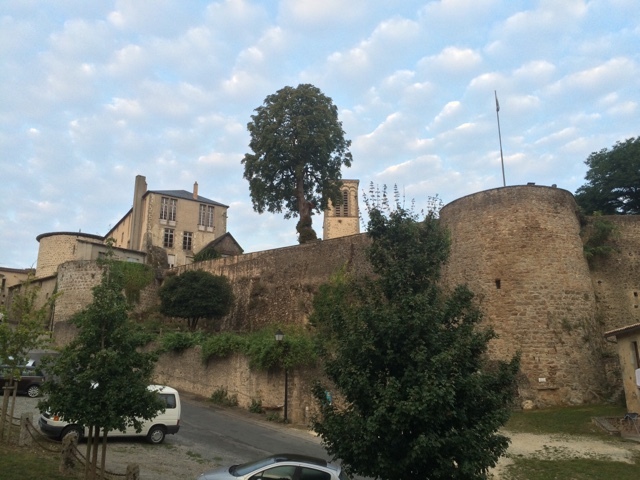 Before we’d even left Parthenay I’d given in and walked up one steep hill and walked down another. I was tired and we still had a long way to go. We left Parthenay by the river, stopping to admire the goats grazing on the almost vertical ramparts and thanks to the extra four cyclists tagging along with us the mood was light and the conversation fun. 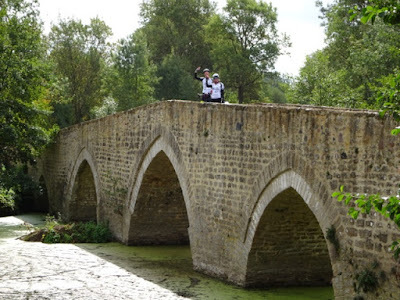 It was a day of pretty rivers, water mills and even prettier stone bridges. 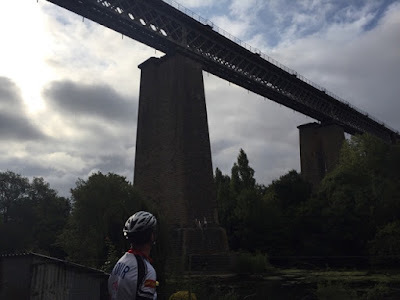 There was so much to see, I’m sure this was what slowed me down (honest). 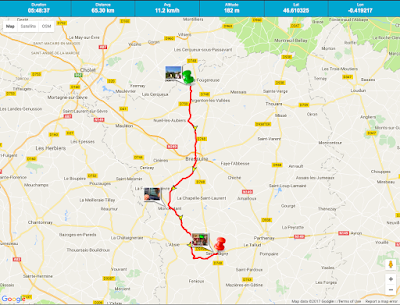 Lunch was a delicious and filling plat du jour in Airvault and the perfect fuel to keep me battling the hills of the north all the way to Luzay and the Trompe Souris Café. The steep and narrow road to the café was probably one of the scariest gradients imaginable, so I walked, but the café was certainly worth a visit. Nestled among rock pools on the River Thouet, the views were amazing, there were comfy loungers and they had kindly offered us refreshments of beer and cakes. I felt so much better after our stop here it was truly magical. 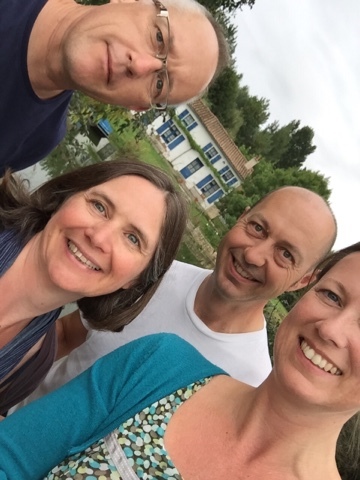 There were more hills, more stunning views and more ancient stone bridges all the way into Thouars where author Alison Morton and her husband Steve were waiting for us, with food, comfy beds and chilled bottles of bubbly. These kind people had opened their home to us sweaty cyclists on their wedding anniversary no less. Thanks guys, your hospitality and fun conversation were much appreciated. 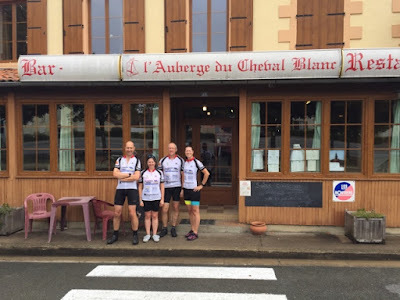 It was a tough 72km today, but the support we were receiving really helped and with four days completed we were two thirds of the way there and had cycled from the south to the north of the Deux-Sèvres. 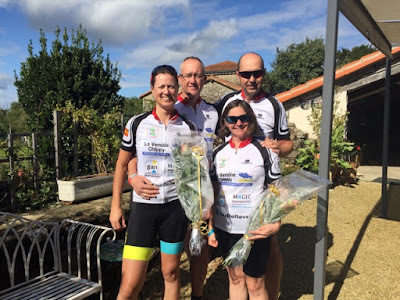 The Tour de Rêves - a charity bike ride around the Deux-Sèvres department in France, undertaken by four mad friends, supported by many others, all with the aim of raising money for Rêves, a charity making dreams come true for seriously ill children. If you have never been to the Marais Poitevin, I urge you to plan a visit. 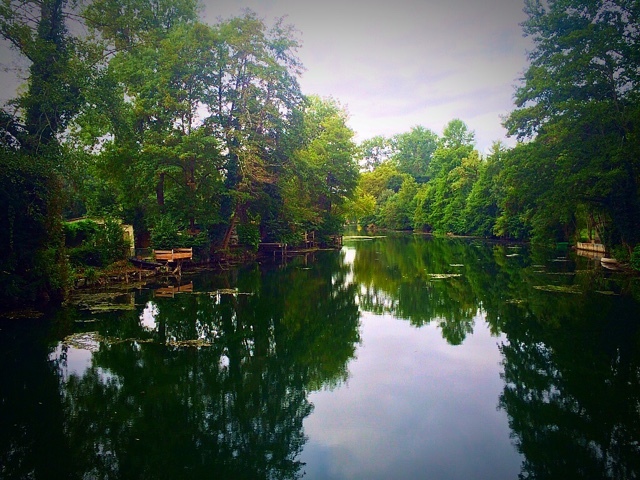 It is a beautiful wetland area of tree lined canals and waterways that is peaceful, calm and full of wildlife. 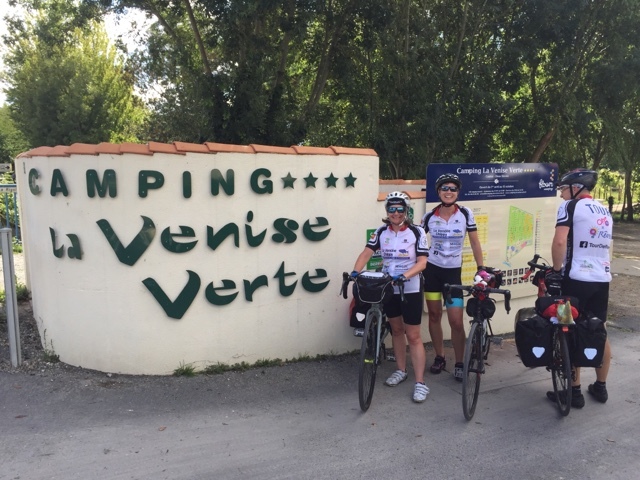 I love a day trip there, so setting off for Day Three, following the Vélo Francette cycle route along the banks of the Sèvre Niortais River, with a glimmer of sun and accompanied by a group of cyclists was picture perfect. 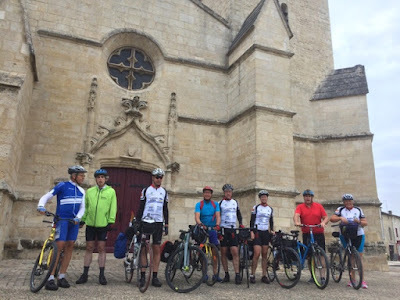 Following an article in the local paper the week before we set off, it wasn’t just our slightly mad friends who joined us for stages of our tour; we had experienced French cyclists too. 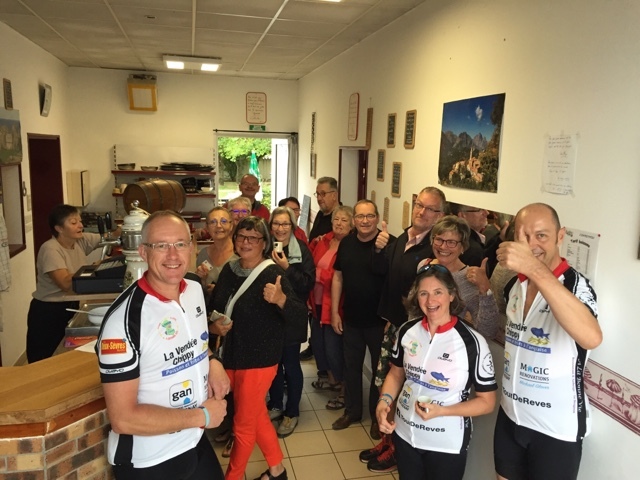 Boosting our numbers from Coulon were five extras including two French friends on their tandem, who stayed with us for most of the day before turning around and cycling it all again in reverse. 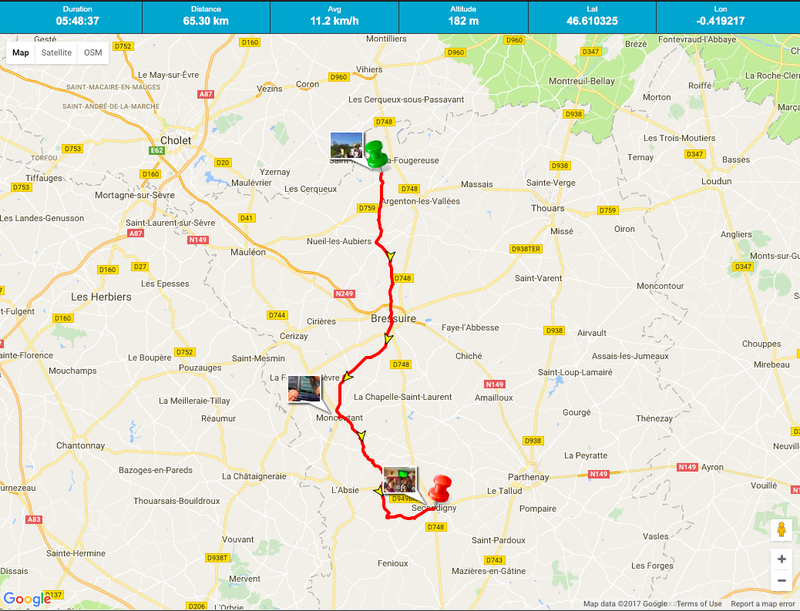 Gulp, there were a lot of hilly kilometres for us today, so a lot more for them and amazingly Edouard was the eyes for his blind friend Patrick and kept up a running commentary of the scenery as we cycled along. They were a true inspiration and having them along really boosted us. 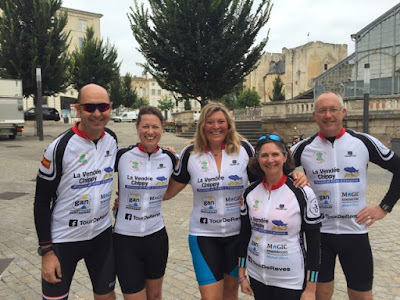 There was certainly a lot of laughter all the way to morning coffee in Niort, when the terrain was flat and the river a calming influence. 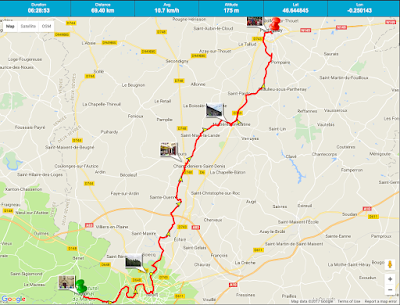 Almost immediately we left Niort the hills started which for me slightly curbed the excitement of cycling in new territory. It was a hard work afternoon, pushing to the top of a hill, freewheeling down and pushing back up, again and again and again. Thankfully the scenery was beautiful, it wasn’t raining and we were not alone. By the time those who joined us in the morning set off back home, four new brave souls were there by our sides to cycle with us up and down the hills into Parthenay, where a welcoming committee were waiting at a bar with beer. It was pure bliss to crash out for a pre-dinner snooze on the comfy bed at the chamber d’hôtes in the old medieval city, and it was even warm enough to wash and dry the cycling kit, something we hadn’t been successful with at the campsite the previous night. Dinner was a delicious meal at one of Sarah and Rob’s favourite restaurants where we celebrated completing another 70km and being halfway around the Deux-Sèvres. 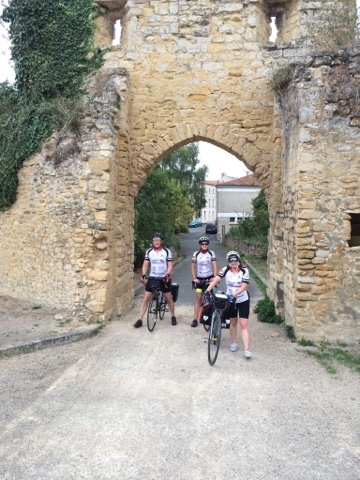 We even gave our legs a good post-cycling stretch wandering around the floodlight ramparts before falling into our beds. We all agreed that although it was hard work, we were having a great time and it was all for a good cause too. 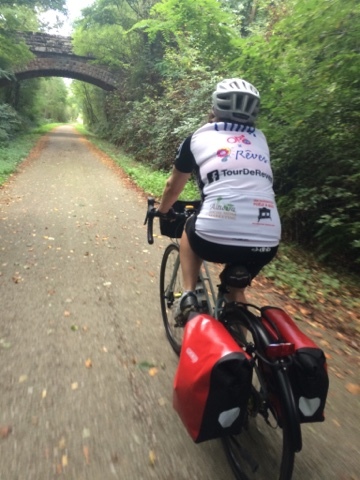 If you would like to make a donation to Rêves in our name, please click here.